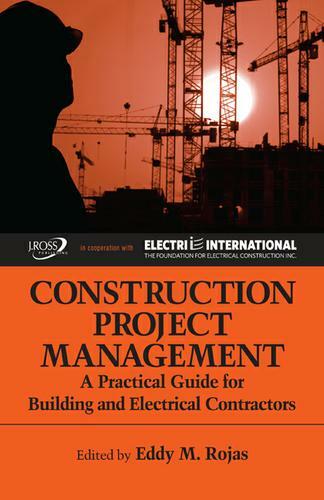 Construction Project Management offers some of the best project management studies commissioned by ELECTRI International: The Foundation for Electrical Construction that were selected, coordinated, and monitored by some of the most progressive contractors and performed by outstanding scholars from top U.S. universities. Topics include pre-construction planning, early warning signs of project distress, impact of change orders, project sequencing, ideal jobsite inventory levels, tool and material control systems, recommended safety practices, partnering, total quality management, quality assurance, performance evaluations, and contract risk management. All specialty and general contractors will find value in this practical book. The concepts presented will improve your understanding of the main issues affecting construction project management and will provide you with tools and strategies to enhance your company's productivity and profitability. --Checklists for each one of the 10 categories that make up the model pre-construction planning process, including standard procedures for change orders, RFIs, submittals, transmittals, billing, progress updates, a sample requirements and expectations letter and a sample letter of intent. --A Spanish translation of Chapter 7: Recommended Safety Practices. --A methodology for assessing contractors' TQM program progress based on the Malcolm Baldrige National Quality Award Criteria. --Materials to assist contractors in preparing a quality assurance manual and implementing an effective quality assurance program. --A template for a partnering workshop that includes a sample partnering agenda, an introduction to the basic partnering concepts, sample mission statements, and a sample partnering charter. --Sample evaluation forms that contractors can customize to evaluate supervisors, journeymen, and apprentices. Dr. Eddy M. Rojas is Professor of Construction Management at the University of Washington, where he is the Graduate Program Coordinator and the Executive Director of the Pacific Northwest Center for Construction Research and Education. He is an internationally recognized scholar in construction engineering and management. Dr. Rojas has published numerous papers in professional journals and conference proceedings and is also the developer and facilitator of the Virtual Community of Construction Scholars. His research interests are modeling, simulation, and visualization of construction engineering and management processes; engineering education; and construction economics.